une 2000. Martin Cohnstaedt lies in a bed at West Park, a continuing care hospital in Toronto, surrounded by photographs and other memorabilia. He holds my right hand in a firm grip, his blue eyes alive as I talk about Canadian politics, the weather, children. Only when he lifts the large, stuffed, black and white cow he holds in his left hand to his mouth and tries to eat it is it evident that Im talking to a man who has Alzheimers. Martin doesnt know that the stuffed cow isnt food any more than he knows that the woman standing on the other side of his bed is Joy, his wife of thirty-two years. There are many ironies in Martins story, not the least of which is that he has achieved through disease a condition that many of the rest of us can only aspire to: the ability to live not in the past or in the future but in the moment. For Martin, at the age of 82, there is only an endless now. The photographs that surround him are slivers of memory frozen in time. Martin has just celebrated his seventh birthday turned seven when his family is photographed in Frankfurt am Main, Germany. (His namesake, Luther, had nailed his manifesto to the church door 400 years before his birth on October 12, 1917.) Martin smiles at the camera. Hes finally coming into his own after years of sickness. The malformed feet he was born with had to be broken and reset; he spent months recuperating. Hed also been slow learning to speak. Now, at last, he is going to school and quickly catching up with his peers. Martins father, Wilhelm, wears a three-piece suit and a stern expression. He is a respected senior member of the editorial board of the Frankfurter Zeitung, an influential liberal daily, the German equivalent of the Manchester Guardian. Wilhelms father, Ludwig, a practising Jew, created the papers independent economic and financial pages, an accomplishment for which he had been awarded an honorary doctorate by the kaiser. At Wilhelms side is Else Gobel, his wife, a non Jew. Theirs is a secular household. A sophisticated woman, she teaches French, Italian and English and has travelled widely. Her circle of friends includes artists and writers, among them G.K. Chesterton, who dedicated a poem to her. Else is a vegetarian, as are all three of her children until they leave home. Shes a student of Rudolf Steiner and deeply interested in organic farming. 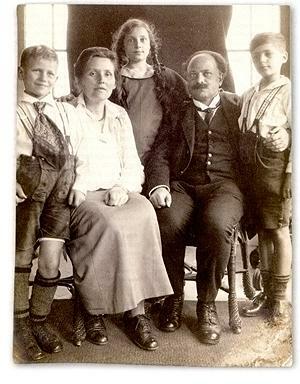 Wilhelm fought at the front during the First world War was away during the First World War  he was a decorated artillery officer  while Else stayed home, looking after their two older children, Ruth and Hans Jacob, and Martin when he came along. They were well-to-do, and the only hardship visited on the family during these years was the occasional rationing of milk. When Wilhelm returned from the war, he threw himself into the struggle to create a democratic Germany. He helped frame the Weimar Constitution (1919), a document that embodied, as the American historian Louis Snyder has written, the best features of the British Bill of Rights, the French Declaration of the Rights of Man and the Citizen, and the first ten amendments of the American Constitution. It also contained the seeds of its own destruction. In Article 48, the president was given the power to abrogate temporarily, wholly, or in part, the fundamental rights laid down in the Constitution. It would come to be known as the suicide clause. The document that Wilhelm helped breathe life into would eventually lead to his own death. Hitlers accession to power on January 30, 1933  and his subsequent invocation of Article 48  had an instant effect on the Cohnstaedts. Wilhelm, a political specialist at the Frankfurter Zeitung, knew the papers future depended on his writing a conciliatory editorial. He would not. I cannot write the editorial that will guarantee we publish tomorrow, he told colleagues. The editorial I would write would guarantee our being shut down before evening. Another editor wrote the appropriate words, and Wilhelm resigned.